10/30/05 6 Hr. 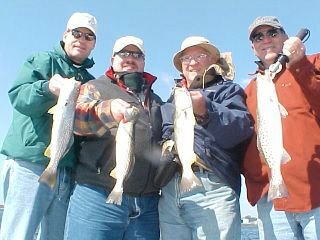 Morning Trip with 4 clients aboard (Alan Pipkin Group) Alan, his buddy and their two sons braved the cold today for some trout. 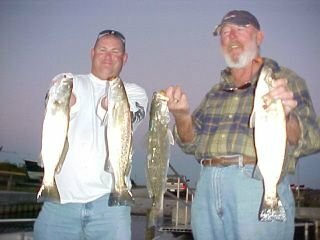 We worked hole after hole and the bite was ok but the fish were small today. 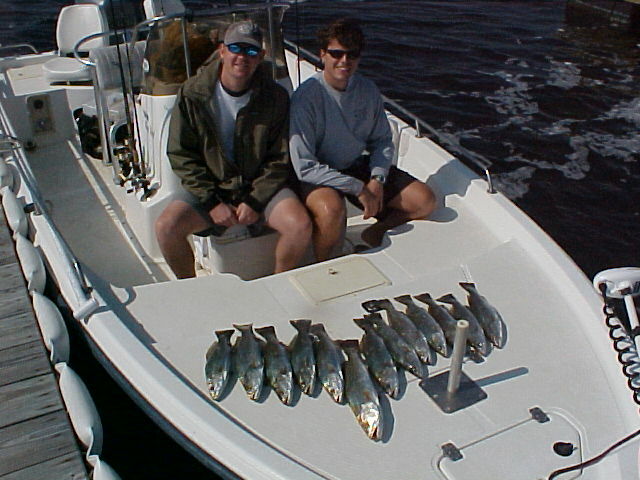 We wound up landing about 25 to 30 trout with a bunch of small keepers. 3Hr Afternoon Trip with Tony Fincher (of King Fish Team "Open Wide"). 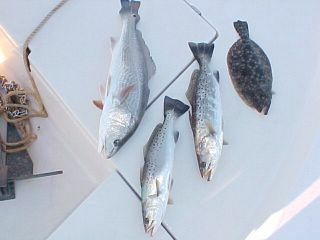 We went a chasin some white water reds... and man did we get into the Reds today. These fish were striking anything thrown, including topwater baits! We worked school after school with the trolling motor and managed over 40 reds from 23 to 27in. 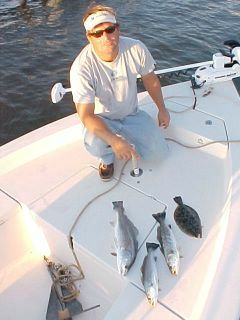 along with 2 flounder 14.5 and 16in. 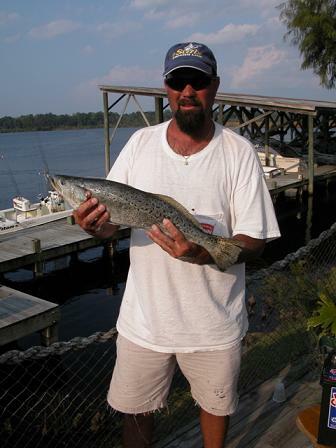 and a 2.5lb speckled trout. Tony, I hope that your 27in. 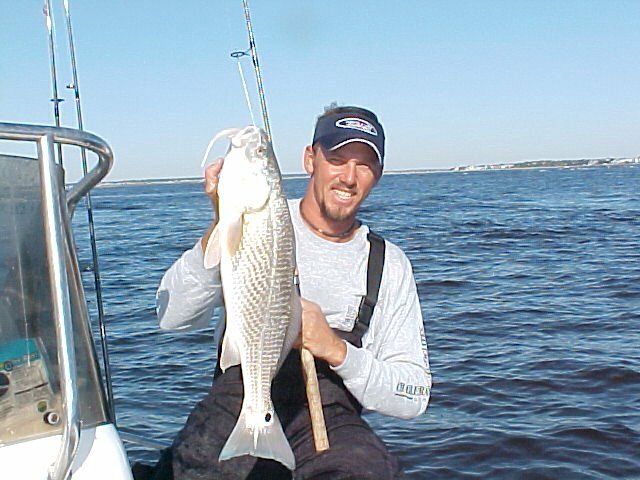 7lb 7.2oz red drum gets you in first place in your Top Dog Tourny! Great Job Man. Capt. 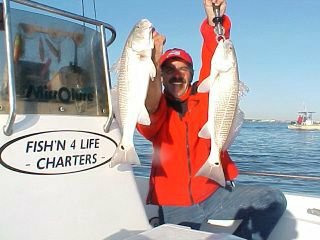 Jeff Cronk- FISH'N4LIFE CHARTERS. 910-326-7512.... The fish'n is on fire! A few open dates left for November... call soon! 10/30/05 Tony... Slightly excited! 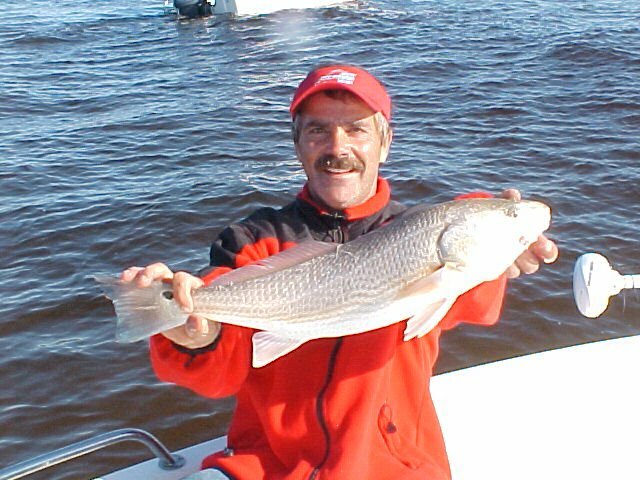 Come on Tony... didn't you get enough excitement fishing the King Tourny down south this whole week? 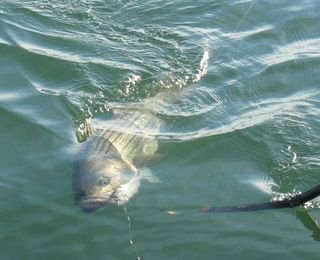 Don't forget about Striper season coming this winter! Call now to book your trip with myself or Jeff! Sorry for the long lapse in reports but we have been very busy with the tournaments. 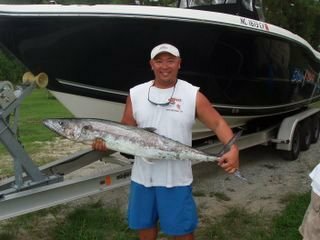 The fall King bite has been strong with many fish coming off the beach. 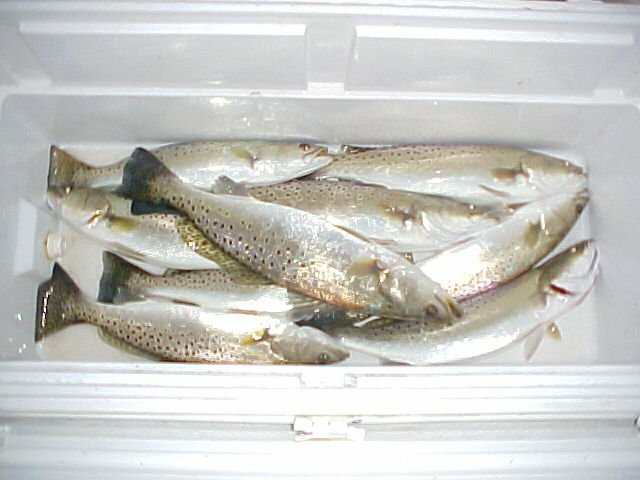 The fish are getting spunky with the temp drops. 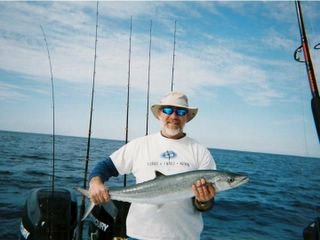 Fish skying on baits and making long runs are the norm. Here are some pics to wet your appetite. 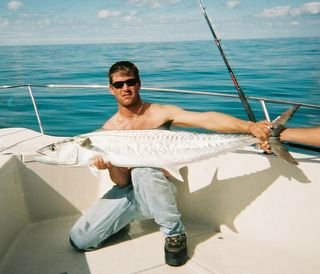 Nice fish, I like his shirt too! 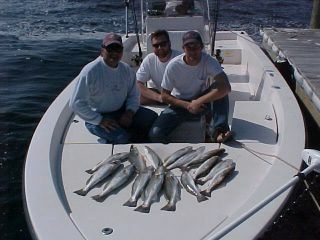 10/27/05 2 1/2 hr trip with capt. 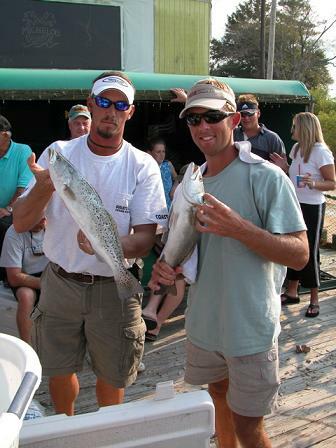 Joe webb of the Billy Anna aboard Looking... heck the looking... just pure'T catching the speckled trout. 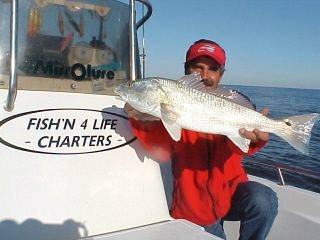 All fish on Mirrolures! First spot first cast, 3lb trout.... 3rd cast another 3lber.... a couple casts later another 2.5lber... and it was on. 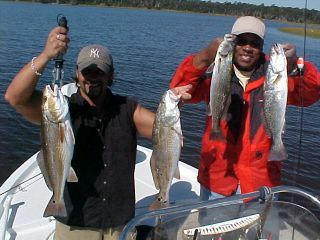 We fished two spots and wound up landing over 30 nice specs... we kept about 11 from 1.75 to just over 3lbs. The trout bite is ONNNN! It typically lasts good through all of November... and slows as we get into mid December. Got a few dates left open in November... weekdays and weekends... call asap to reserve one before they're gone. 910-326-7512 or boat 336-558-5697. Capt. 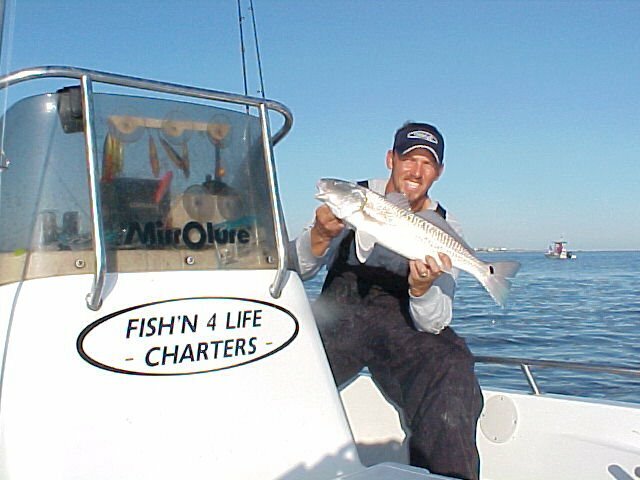 Jeff Cronk- FISH'N4LIFE CHARTERS... ps... thanks todd for holding those fish I caught... shouldn't you be king fishing? 10/26/05 Here's a better shot of the fish... from this afternoon 4lb red, 2.5lb trout, 2lb trout and a 14.5in flounder. 10/22/05 Good friend Jason Guthrie of Swansboro and Myself, Capt. Jeff Cronk, with our second place win in the 3rd Annual Jacksonville Speckled Trout Tournament. 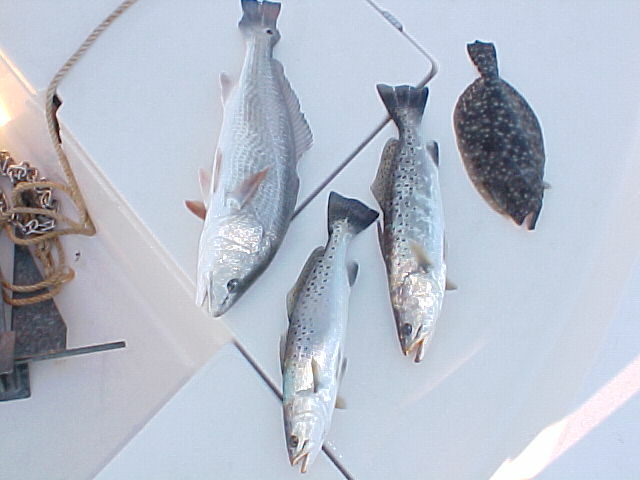 We had upwards of 38 speckled trout today and managed a 10 fish aggregate of 21.04lbs. After dealing with some strong winds, lots of rain, and some thunder and lightning early in the morning it shaped up to be a nice day with a steady trout bite on most locations. Next Tourny is Sunday, Nov. 6th followed by Sat. Nov. 12th. 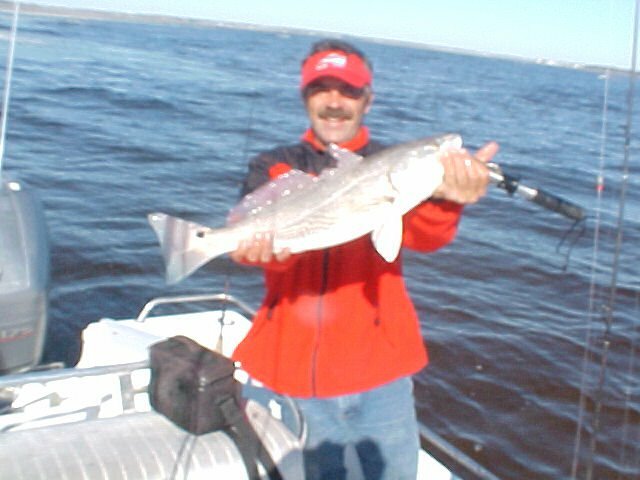 10/22/05 David Moore of Swansboro with a nice spec over 4lbs at weigh-in. 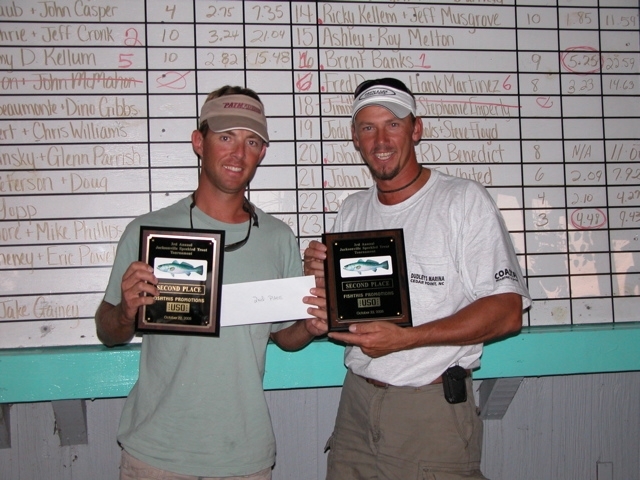 10/22/05 Myself and Jason Guthrie holding a few nice 3+lb specs at weigh-in at the Marina Cafe in Jacksonville, NC. 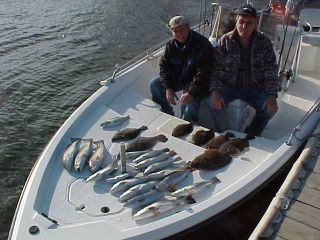 HERE'S A SHOT FROM NOV. 2004 THIS TYPE OF MIXED BAG IS A COMMON OCCURANCE DURING A FULL DAY TRIP ABOARD FISH'N4LIFE. We had red drum up to 5lbs, speckled trout up to 3lbs, flounders up to 4lbs and lots of panfrying fish to boot. 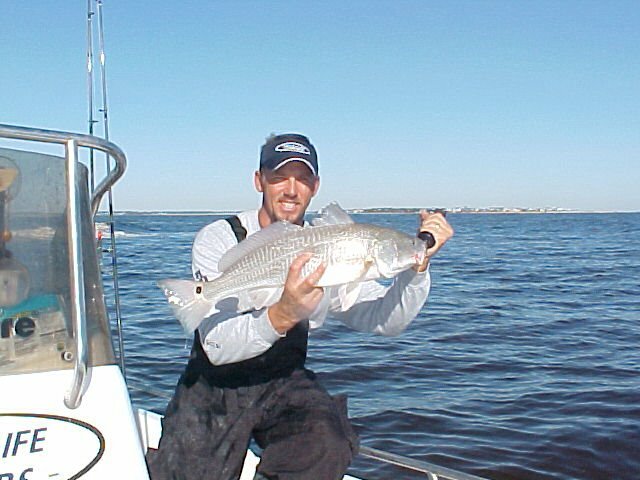 Current Open Full Day Dates for November 2006 include the following 11th, 13th, 20th, 25th, 26th, 27th. Current Open Afternoon Dates for Oct. and Nov. include all Tuesdays, Thursdays, and Fridays... several of these weekday afternoons are booked so call for afternoon openings. 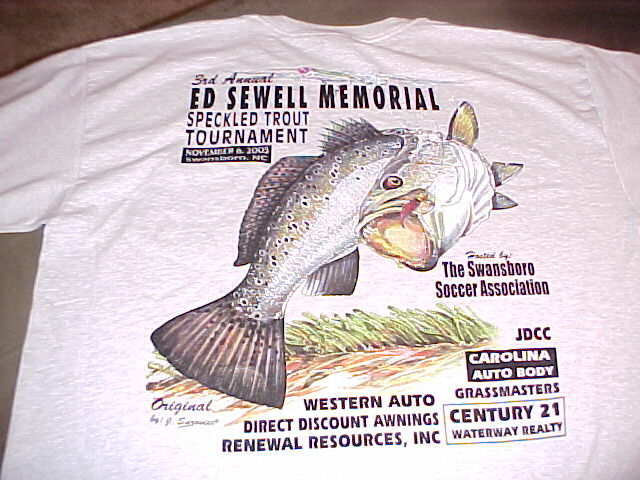 910-326-7512 or boat phone 336-558-5697. Thanks to everyone for taking the time to use my guide service and taking the time to check out my website. Capt. 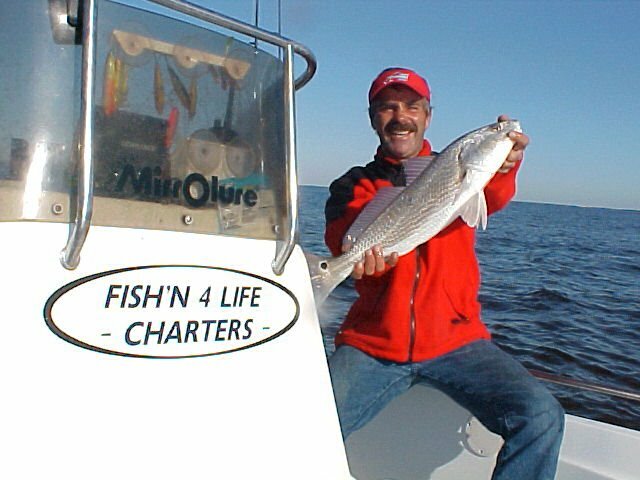 Jeff Cronk- FISH'N4LIFE CHARTERS. 10/15/05 4hr trout charter with Matthew Cochrane group from Raleigh, NC. We battled the extremely high incoming tide and strong breeze this morning and eventually found a good bite on the trout. Matthew and his buddy managed to land 17 keeper trout with 13 that weighed between 1.75 and 3.1 lbs using live shrimp, mirrolures, and paddle tail grubs. Back at the dock at 11:30. Excellent job guys. 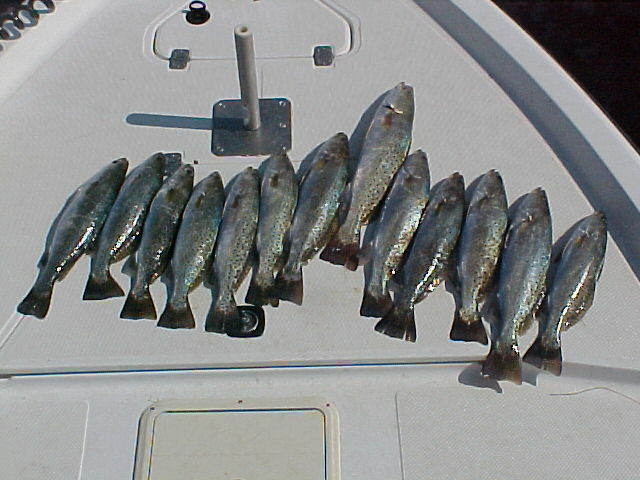 10/15/05 Another shot of 13 out of 17 specs caught today. All 13 ranged from 1.75 to 3.1lbs and were caught on live shrimp, paddle tail grubs, and mirrolures.